Fortunately rust isn’t as severe in the desert climate of New Mexico as it is in humid locales. Still, the New Mexico Steam Locomotive and Railroad Historical Society (NMSL&RRHS) expected a battle with rust in the restoration of the Baldwin Tender 2926. Our expectations were on target. Removal of the fuel bunker from its pocket in the tender revealed the most severe rust we have encountered. Over the years the pocket had proved to be an effective rust creating moisture trap. The rust was not yet severe enough to cause structural weakness, but it wasn’t pretty. Large areas of the outer surface of the fuel tank and inner surfaces of the pocket had severe pitting and a lot of rust scale. With the fuel tank due to go back into that moisture trap after restoration, we searched for a permanent solution. 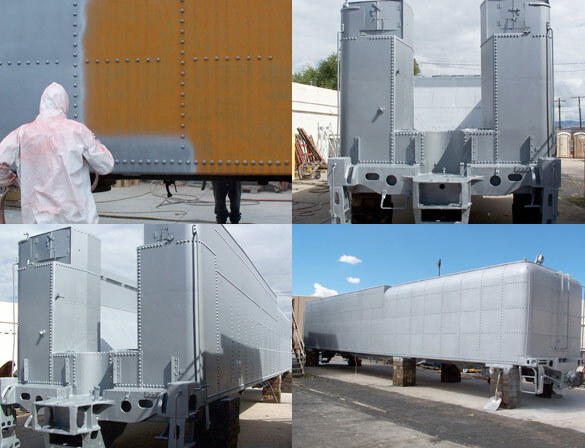 We wanted something to stop the existing rust activity and prevent future corrosion. A referral from Bob Kittle, provided the solution. It was called RUST BULLET. We found Rust Bullet was billed as “not a paint in the ordinary sense of the word.” It required no preparation other than light scraping or brushing to remove large flakes of rust. Its behavior, when applied differs from conventional paint and rust control materials. The result…an excellent long term solution to our rust problem. Following the outside cleaning of the oil bunker, we applied two coats of Rust Bullet…the ouside of the oil bunker never looked better. When loaded with fuel oil and water #2926 and its tender weigh one million pounds. The tender is thought to be the longest tender ever built. When work is finished on the engine it will be the largest restored and operating steam locomotive in the world. 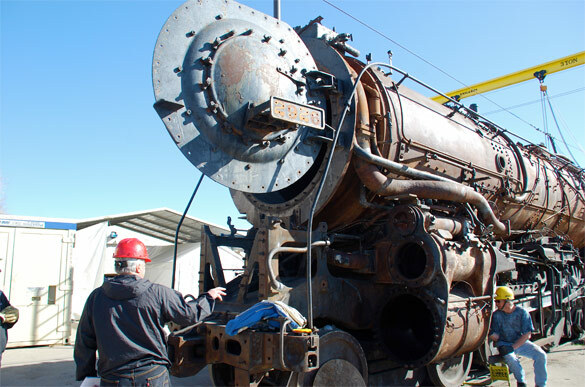 Restoration of 2926 falls to the New Mexico Steam Locomotive & Railroad Historical Society. This group of 200-300 volunteers started working on the tender in 2002. That project took longer than expected. For one thing, inside the tender are oil and water reservoir tanks. These tanks contain a labyrinth of passages and cells that are designed to keep the water from sloshing around too much, especially on curves. Cleaning them was difficult. And over 3000 pounds of corrosion and debris was scraped out of the water tanks alone. A letter to the Late Robert Murphy, President of Rust Bullet, LLC. We have had a busy time the last month working on the ATSF 2926. Crews worked to clean up the asphalt coat that had covered the fuel tank in places. We used a Hotsy, hand tools, soda blasting, wire brushes, solvents, grinders, needle scalers and a lot of elbow grease to get the gunk off the outside of it. We also had a busy time getting ready to have the tender’s body lifted up off its trucks and set off on cribbing. That would allow the big Buckeye trucks to be swung off onto temporary track for brake and bearing work. Last Saturday Albuquerque had the most rain that it has had on an April day in recorded history but our cranes and crews showed up from Messer Construction (they do RR derailments for money and help us out of the goodness of their boss’s heart) and we got the tender swing done between storms. Totals? 11.5 tons for the fuel tank, 35 tons each for the trucks and 80 tons for the tender body with those items removed. Read about it in our next news letter which will be coming to your company in a month! In 1956, when all steam locomotives on the Santa Fe were finally replaced by diesels, the railroad donated 2926 to the City of Albuquerque where it was placed on display in Coronado Park (2nd and I-40). Through the years, the elements, vandals and collectors each took their toll on the locomotive and tender. Yet it remained a striking reminder of the golden age of railroading when steam reigned supreme and travel by rail was not only fashionable, but also a way of life. On June 23, 2000, our Society moved locomotive 2926 from its quiet resting-place of forty-four years to a nearby siding, adjacent to the Burlington Northern and Santa Fe Railway main line. The ultimate location of 2926 will be on the site of the historic Santa Fe Railway Steam Locomotive Repair Shops in downtown Albuquerque, as part of the WHEELS Museum. Once there, members of the New Mexico Steam Locomotive & Railroad Historical Society will continue their work on its restoration to full running order.